Headquartered in Lugano, Switzerland, Casale SA leads in the design and retrofit of chemical plants. The IT department of the company had to control administrative access to their heterogenous devices at two levels: internally by the IT staff, and externally by the third-party consultants involved in their research and development processes. The team faced proliferation of privileged accounts and found it increasingly difficult to properly maintain and keep track of those accounts. 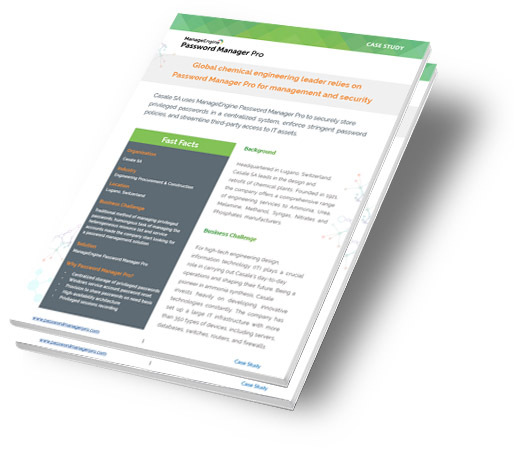 They deployed ManageEngine Password Manager Pro to securely store privileged passwords in a centralized system, enforce stringent password policies, and streamline third-party access to IT assets.